Good Morning! I hope you had a nice weekend! We worked a little more on our home office/study project and made some good progress this weekend. 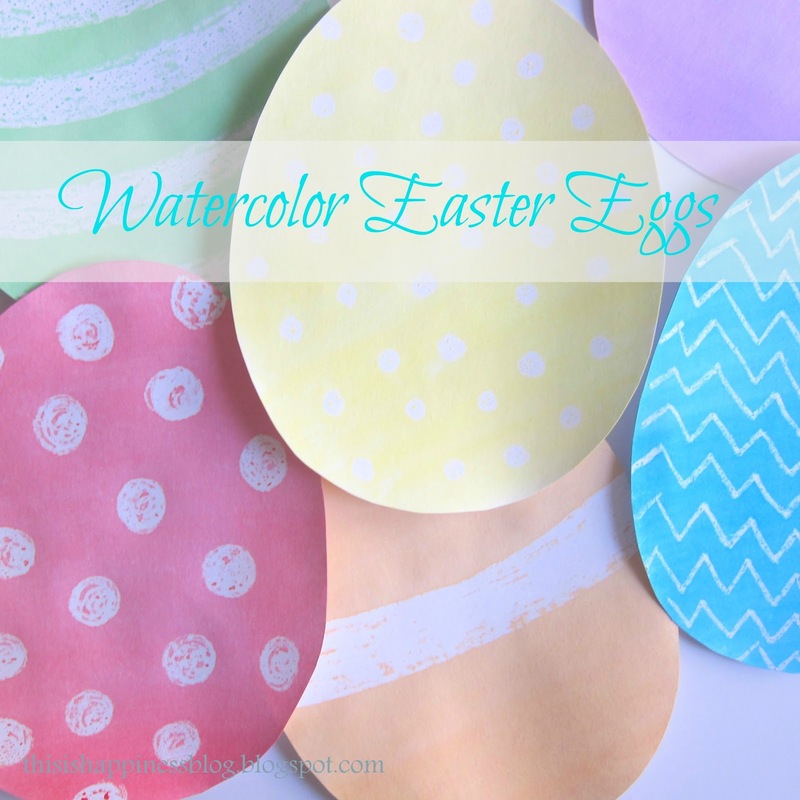 Preston was supposed to play in his last regular season basketball game on Saturday, but he was still not ready to do that much intense running after being sick last week, so in between our office project, the kids and I had fun painting these watercolor Easter eggs. I saw this idea floating around Pinterest and on Courtney's site with the Valentine's Day conversation hearts. Since I missed the boat on that holiday, I thought we would changed it up from conversation hearts to Easter eggs. 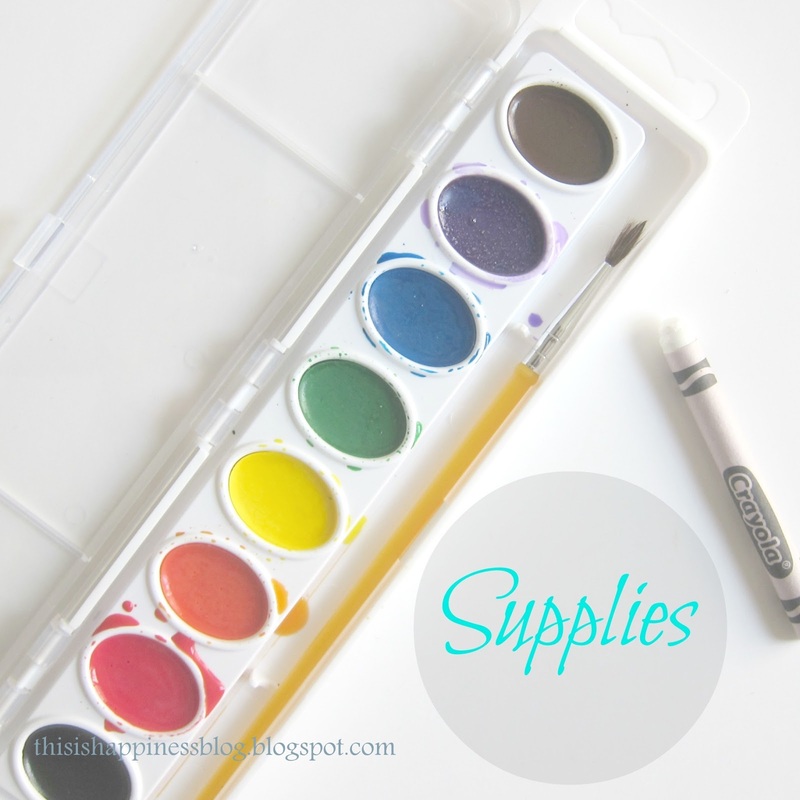 All you need are watercolor paints, a white crayon, and cardstock. Write or draw your design on your paper with the white crayon, paint over it, and watch it magically appear. 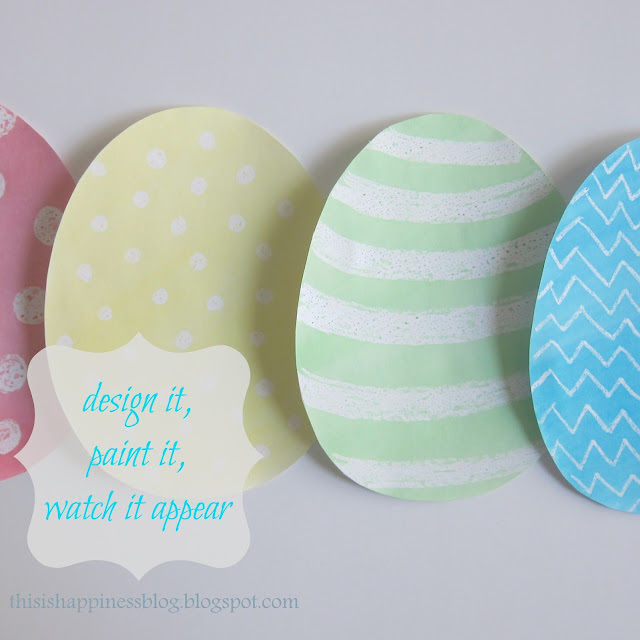 Here are the Easter ones we made displaying some of my favorite patterns...polka dots, stripes and chevron :) We also had fun painting names, monograms, and drawing pictures on regular cardstock. We did several that I wrote a word or drew a picture and then the kids painted over it. They couldn't wait to paint over what I wrote and reveal the mystery! It was a fun little craft that required minimal supplies and was fun for the everyone. I was kinda like dying Easter Eggs, but a lot less messy. These are awesome! We'll have to try this perhaps for placemats. *for some reason, blogger and OpenID/Wordpress aren't getting along. I love it, and look forward to doing it with our li'l girl when she's older. I think I might modify this for a birthday card project or two, and possibly put a Christmas or Halloween spin on it. That makes me think it could be an activity at a kid's party or group thing. Thanks Wendy! It would certainly be fun for any of those ocassions! Very cute, stopping by from TT&J!